Valerie wrote about her research in the book: The Beehive Effect: Ancient Rites; Quantum Principles. Then in 2017, she had the opportunity to travel to Mexico where she recorded the Mayan Melipona Bees. The Melipona bee is a stingless bee native to Central America and sacred to the Mayans. The Madrid Codex (a 112-page Mayan book documenting the culture, rituals and daily life of the Maya) devotes the last 12 pages to glyphs depicting the ancient rite of Melipona beekeeping. 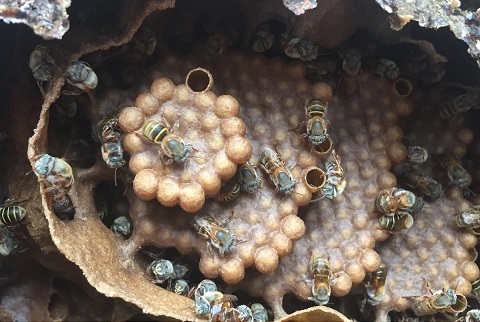 Inside the hive, Melipona bees create hexagonal tubes for the queen to lay her eggs. These tubes are built up from the floor of the hive. Each circular layer is a step up from the layer below in pyramid-fashion. The honey and pollen are stored in wax pots that are located around the egg cells. The Melipona is small and delicate (more the size of a fly), but its honey is prized for its curative properties. Unlike European honeybees, it has never been genetically manipulated. Research illustrates the healing effects of the sounds in nature. They are fundamental to life and they are are an intrinsic part in the creation of full-spectrum living water. Vibration itself can be considered a nutrient. The liquid crystalline structure of the human body (and all biological life) was designed to absorb and respond to vibratory information delivered through water. Playing the song of the Melipona Bees creates streams of living light that bring coherence to water and alignment with the living field of energy that surrounds us. When water is exposed to the Melipona bee song, it acquires a smooth texture and becomes exceptionally balancing for mind and body. 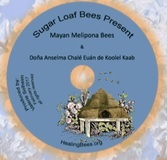 Allow yourself to enter the eternal, healing song of the Mayan Melipona Bees. When adding "information" to water (referred to as "imprinting"), it is a good idea to protect the imprint by storing the water in an egg-shaped container such as the Water Cradle or by using a Tensor Ring which creates a column of energy around the water. Quartz crystals, Triskelions, ANCHI Crystals, and orgonite will also help to preserve the information you add to water. I have been playing the Melipona Bee song CD to my water for about a month. I love the energy and the texture it creates in my water. I have noticed that my grandsons (age 2 and 3) ask for the water that I expose to the Bee songs more than any other water I have. That's interesting because children naturally gravitate to things that are good for them. We all enjoy listening to the CD too. It's very beautiful.